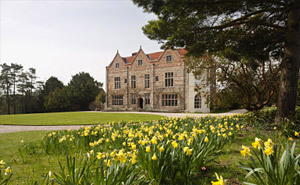 Many historic gardens grace this ancient county, filled with elegant stately houses and old market towns. Oxford boasts one of the oldest botanical gardens in the world, and one of the nation's greatest 18th century landscaped parklands can be found at Blenheim Palace. Magnificent 18th-c Palladian mansion, set in picturesque landscaped parkland. It has some of the most unforgettable water gardens, by Harold Peto. The water flows through a canal that steps down a gentle incline, bordered by clipped box and Irish Yews. It widens and narrows, flowing under little bridges and occasionally bursting forth into playful fountains, finishing in a wide lake with temples and follies. Surrounding this baroque style mansion are some of the most beautiful formal and walled gardens. That lead out into 2100 acres of parkland, landscaped by 'Capability' Brown. 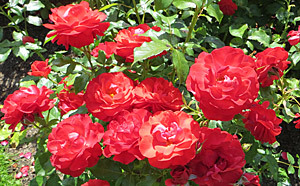 A walk though the grounds leads to an arboretum, a rose garden and formal water gardens. Attractions include a maze, a narrow gauge railway and an adventure playground. 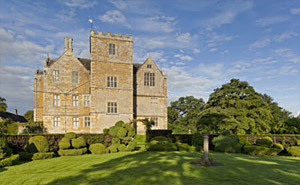 One of Britain's finest Jacobean country residences. 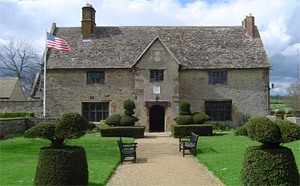 The house and gardens, which have remained virtually unchanged since its construction in 1603, are now lovingly conserved by the National Trust. The gardens are laid-out in a typical Elizabethan style with Jacobean topiary. 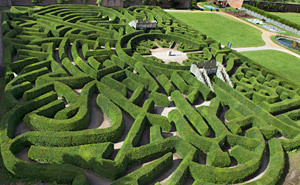 A 16th-c brick built Tudor style house with walled gardens, ornamental vegetable gardens and a maze. The remains of a medieval fortified tower provides a romantic backdrop. An attractive castellated mansion, built in 1635 by Sir Robert Dormer. 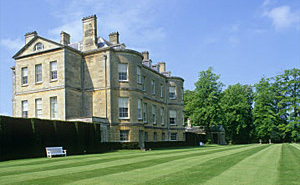 Later owned and modified by William Kent (1685-1748), whose landscaped gardens still remain. The traditional English landscape design retains many of its early features, including the Temple of the Mill and the cascades in Venus's Vale. 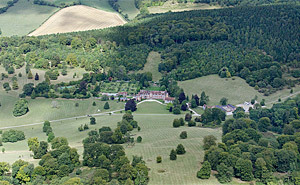 A 12th-c Tudor style mansion house set in a wooded valley with beautiful gardens and a vast deer park. Home to the gardens of the Herb Society. Packed with a wide variety of plants and herbs, introduced mainly from the Americas by the ancestors of George Washington, as well as other culinary and medicinal plants. 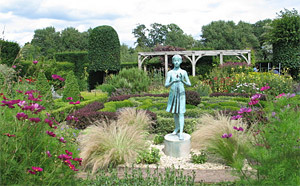 Long established eight acre ornamental and formal gardens with alpines, dwarf conifers, traditional knot gardens, island beds and herbaceous borders. Good Summer and late season interest. Look out for its many secret corners and rewarding long vistas.